Production has begun on “Mira, Royal Detective,” an animated mystery-adventure series for preschoolers slated to debut on Disney Junior channels and programming blocks around the world in 2020. Set in the magical Indian-inspired land of Jalpur, the series follows the brave and resourceful Mira, a commoner who is appointed to the role of royal detective after solving a mystery that involves saving the kingdom’s young prince. The role of Mira will be voiced by 15-year-old newcomer Leela Ladnier. The announcement was made today by Joe D’Ambrosia, senior vice president, Original Programming, Disney Junior. As royal detective, Mira travels throughout the kingdom helping royals and commoners alike. 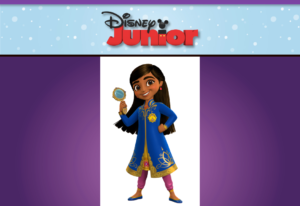 Along with her friend Prince Neel, a talented inventor, creative cousin Priya, and comical mongoose sidekicks Mikku and Chikku, she will stop at nothing to solve a case, taking young viewers on adventures that highlight critical thinking and encourage deductive reasoning. Rooted in India’s vibrant heritage, each episode will weave authentic music, dance and customs into two 11-minutes stories. Emmy Award nominees Matthew Tishler (“Fancy Nancy”) and Jeannie Lurie (“The Muppets”) will write and produce original songs, and Amritha Vaz (“Miss India America”) will serve as composer. The series is produced by Wild Canary in association with Disney Junior. 16 queries in 0.455 seconds.